Developer Quote: "Now Then is the must-have time tracking app for your iPhone, iPod touch and iPad. It helps you record and analyze what you spend your time doing, on a device you have with you at all times." • Record the hours worked on a job. Using Now Then to clock in and out with ease. • Use a task list that suits you. We do not prescribe the structure of your task list. Our task list is hierarchical - this can be as flat and simple, or as deep and complex as you wish. • Quickly change the current task. Use of the keyboard is kept to a minimum. • Accurately track time spent. Correctly claim for the work you actually did. • Simple and focused time keeper. Now Then is tightly focused on tracking time, and nothing else! We do not complicate the interface by trying to do too many things in one place. • Stays out of your way. You are in and out quickly, with the minimum number of taps. • Manage your time more effectively. Having a record of what you actually do, lets you better manage how you spend your time. • Identify misused time. Quickly identify problem areas using colourful summary charts. 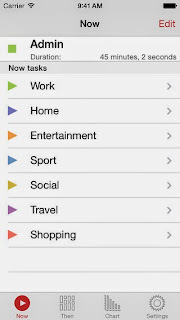 • Now View - Simple, rapid task selector for recording what you are doing now. Simply tap to start/stop tasks (or tap on another to switch to it immediately). • Then View - What you were doing, and when. View by day, week or month. 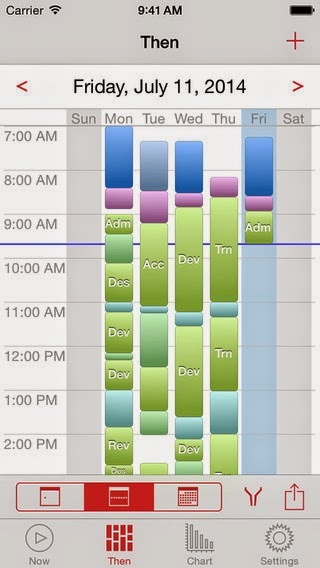 A visual log of how your time was spent. • Chart View - See the proportion of time spent on each task, or group of tasks. View bar charts and pie charts by day, week, month, or year. • Filter both Then and Chart by task, date, or by time. • User-definable Task List - User control over the task hierarchy - make this as simple, or as complex as you desire. • Edit Recorded Events - Or add forgotten ones afterwards. • Share Data and Images - Export your data and images for sharing, or further analysis elsewhere. Data is exported in CSV format which is very portable. • iCloud Sync - Keeps your data in sync across all your iOS devices. • Universal - Runs on iPhone, iPod touch and iPad. 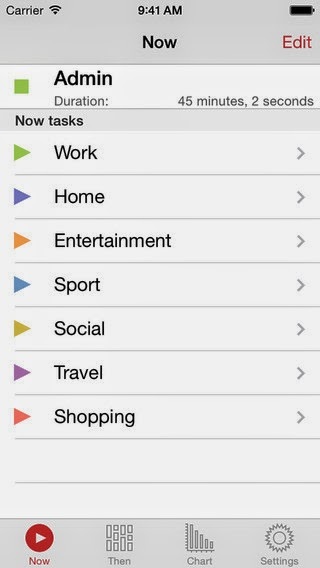 Try Now Then to organize your tasks, filter and view your items, sync it across all your devices, and hey presto - your day has become totally manageable!